Samantha Sherman | Montefiore saved my life and stole my heart. At just 37, while running on the treadmill in her basement, Samantha Sherman began to feel nauseous and dizzy. She recalls trying to shut off the treadmill, but when she awoke on the ground, it was still running. Thinking she had a concussion she went to the ER at a local Greenwich hospital where she learned she had had a stroke. The subarachnoid hemorrhage due to a ruptured aneurysm in her brain was beyond what her local hospital could care for, so a family friend and plastic surgeon recommended she see vascular neurosurgeon, Dr. David Gordon, a specialist at Montefiore dually trained in open and minimally invasive surgery. Once at Montefiore, Dr. Gordon performed an endovascular coiling procedure on Samantha. A guiding catheter was inserted into the femoral artery in her leg, and a microcatheter was then inserted through the guiding catheter into Samantha's ruptured aneurysm. Coils were then inserted through the microcatheter to close off the aneurysm and prevent it from further bleeding. Because she chose to go to the one hospital in the region that can treat very complex neurovascular cases, Samantha was able to avoid the high risk associated with undergoing open surgery to treat an aneurysm located near the brain stem. Thanks to the amazing teamwork of the Departments of Neurological Surgery and Radiology, the treatment was a success. Samantha is now back to the life she loves to live, managing a busy household, taking walks in her neighborhood, spending precious time with her kids--and taking nothing for granted. 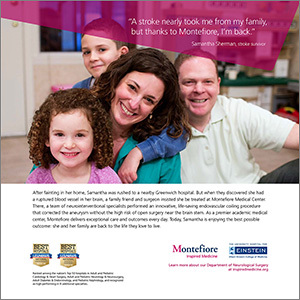 Montefiore is comprised of the highest caliber neurosurgeons and neuroradiologists. Our physicians use the most advanced procedures to treat patients of all ages suffering from a broad spectrum of often complex and life-threatening conditions such as strokes, aneurysms and vascular malformations. Because of our competence in innovative and minimally invasive techniques, we can often eliminate the need for open surgery. Montefiore is one of a small group of medical centers in the New York metropolitan area, and the only hospital in the Bronx, to offer such state-of-the-art services for complex cases.